You'll be £25.00 closer to your next £10.00 credit when you purchase A Year in the Life of Ancient Egypt. What's this? 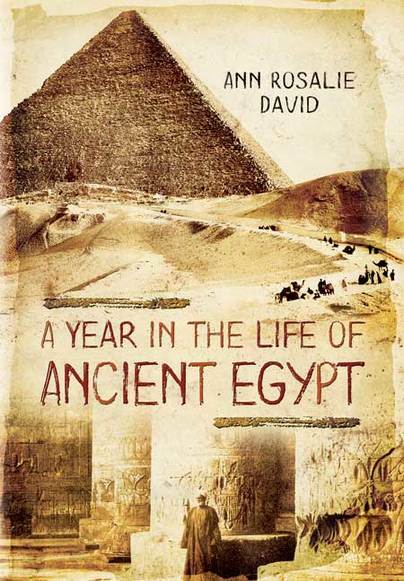 Based on years of prestigious academic work, Professor Rosalie David cleverly presents every aspect of life in ancient Egypt through the lives of various characters, all based on mummies from the Manchester Museum whom Professor Rosalie David has led the study of. Characters hail from all walks of life, including royalty, nobles, officials, craftsmen and peasants, allowing us an insight into absolutely every aspect of everyday, ritual and religious life in ancient Egypt. The book provides an overview of the many dynasties and kingdoms of ancient Egypt before beginning to tell the story of the lives of one family. All three seasons of inundation, planting and growing, and harvesting are covered as well as all ritual and religious events, including birth and death. The book is extremely easy to read and digest, however, the attention to detail and the vivid picture of life which we are able to build makes it clear that this book has been written by one of the leading authorities in Egyptology and mummy research. The mummies are currently on a tour of the US titled 'Mummies of the World 2' and will return to Manchester following this tour. Egyptian history – as dry as the sand in the surrounding deserts? Not a bit of it. I was somewhat wary of this title as so much has been written about how the ancient Egyptian people lived (their food, religious rituals, work, punishment, legal procedures etc. etc. ), but I needn’t have been. I’ve read much about the Pharaohs over the years, before, during and after visiting the country in the 1990’s. Thankfully this book does not spend all its time reiterating the lives and reigns of the Kings, their wars, harems, dealings with other countries, i.e. : the Minoans or Hittites and of course their building achievements be it temple, palace or mortuary. Out of a 263 page book, all that is dealt with by page 30 and so serves as a useful initiation to the interested everyman but does not talk down to those of us who have read it all many times before. Not to say that the text is anything but well written, concise and interesting. Based upon the lives of one hypothetical family chapters include religious beliefs and practices, trades, crafts, medical and legal procedures, entertainment, personal appearance all under three formal sections – Inundation, Planting and Harvesting. There is even a section on Pets! I was more than aware of the importance of animals in ancient Egyptian life, one thinks of the Apis or Mnevis Bull’s, the animal headed God’s (Sobek, Thoth, Horus, Anubis etc. ), even the sacrifice of animals to the God’s for their benevolence. I had not realised that dogs, cats, monkeys and even geese were sometimes considered to be members of the close family and were depicted on tomb scenes - proof that these ancient people were not so different to you or me. Which just goes to show, however much you’ve read there is always something new to learn, and that is the beauty of this book. Another plus factor in the book's favour is that most of the detail is based upon the Egyptian collection at the Manchester Museum, Lancashire, England. The book is lavishly illustrated in colour but instead of having to make expensive travel arrangements to see these artefacts in Cairo, Luxor or elsewhere, those of us in the United Kingdom, with a more modest budget can go and see the artefacts up close. The museum houses around 16,000 relics, including mummies, and, because of this book it is now on my list of places to visit as soon as possible. From page 31 the facts come thick and fast in a lively, informative, scholarly and entertaining piece of work by an assured author who quite obviously knows ‘her stuff’. Her writing is engaging and fluid, and is a masterstroke at a difficult subject. This book succeeds in bringing freshness to our understanding of a Year in the Life of Ancient Egypt and transports it into the homes of the 21st century.